You are such a generous and wonderful person! My choice of a charity is K9s for Warriors. Ohmygosh! Once again you have rendered me speechless! Amazing! I have always wondered how to make something look like it is behind glass! Thank you for sharing! And, my favorite charity is the Special Olympics Texas! The have 55,000 athletes in Texas alone! That is equal to the the whole country of China! They are an amazing group and I hope I win them a donation! Congrats of so many subscribers! You are amazing! I am so new to all this that it never occurred to me to try to catch the glass highlights! My organization is Bible Study Fellowship, International. It’s a non-denominational organization that is totally prayer and voluntary donation supported, and has grown from 5 or 6 women and a teacher to a worldwide organization that teaches adults and children to dig deep into scripture through disciplined daily study of God’s word. This year we are studying Revelation, next year will be the gospel of John. We rely on scripture to explain scripture. There are needs and goals, but they NEVER ask for donations or do active fund raising. If you have one in your area, I highly recommend it! I love how you share your creativity with us. My favorite charity is Panama City Rescue Mission, bethel village is the homeless women’s shelter in Bay County Florida. May God Bless you for all you do for others! Favorite charity St. Jude’s Children’s Hospital. Love the Fairy and the owl but not into Pintrest. I donate to a charity for our troops. I hope you will concider it as one of your giveaways. It’s called Green Beans Coffee – A Cup of Joe for a Joe. Congratulations on reaching so many more subscribers. I love watching you color and design. You are amazing! I’d like to see you color the jar as I think that is one that I’ll be using in coming months for jars of flowers for summer cards. As for a charity, I believe in helping the community you live in first and then second to health organizations. So if you pick mine, I’d like the money to go to Alzheimer’s Disease Research, 22512 Gateway Center Drive, Clarksburg, MD 20871 Unfortunately as we baby boomers age, more people will be afflicted with alzheimer’s disease than ever before. I think this is very frightening. Love this technique! Can’t wait to try it! Congrats on all the subscribers! My fav charity would be Mercy House Kenya where they rescue pregnant girls from the slum and give them a home, education and best of all, God’s love!! This is SO AWESOME! Thanks so much for sharing that tip with us. I can’t wait to try it. My favorite charity is Ronald McDonald House. My great nephew was born with a severe birth defect where some of his organs were on the outside of his body, some were malformed, and some were just missing. My nephew and his wife have to travel several hours away to special Children’s hospitals for what will be a multitude of surgeries over the next several years to correct things in stages. Everywhere they’ve gone so far, there’s been a Ronald McDonald house close by that they could stay in for free. With all the expenses they are incurring, this has been an AMAZING blessing financially and a comfort to their hearts to be staying with other parents who are in the same boat. I never realized what a very real need they met before now and would be honored if you made a donation to them for our family. My favorite charity is Noah’s Ark Rescue in South Carolina. They are absolutely wonderful. They take in dogs that would have no other chance if they didn’t step up. These are dogs that have either had a horrible accident their families couldn’t afford to fix, abused dogs with no hope of a loving family and dogs that have just been abandoned either because they have a medical issue no one wants to deal with or they are simply “too old” to be wanted any longer. I have seen them transform the most pitiful dog into a happy, smiling fur baby and present them to a family that loves and want them! I very rarely donate to anyone else! Thank you for doing this! Thanks for sharing! Would love a video when you have time. My favorite charities are the MS Foundation because I have MS and World Vision because they do so many wonderful things for children and families! Love all your cards! My favorite charity is Compassion International. My daughter used to work there and they do a lot of good things. I love those cards! My favorite charity is Compassion International! We sponsor a child in Togo. Thanks for sharing your secret weapon. My favorite charity is the Hot Meals/Food Pantry program at our church. Holy Cow! What a great technique! Thanks for sharing. I am in love with your fairy card. Hard to choose just one charity, but I’d have to go with Tu Nidito in Tucson, AZ, which provides comfort and support to kids and families that are suffering from the death of a loved one. Amazing coloring! I love your work! My favorite charity is the Arizona Friends of Foster Children Foundation. The Foundation provides special things to foster children that the state doesn’t provide–such as little league fees, sports equipment, bikes, prom dresses, tutoring, etc. These things help normalize the children’s situations and build their self esteem during what is often a very difficult time for them. Finally, a way to do this easily…no stress, just a little gesso and a day baby wipe. Yay! Love the idea of the charity giveaway. The one closest to my heart is the Sacramento SPCA. They really do awesome work. Yay! You conquered the glass effect! Wonderful job, wonderful cards! Charity: Royal Family Kids’ (Pasco), taking kids who have all sorts of issues from the abuse they’ve been through and giving them one week at a camp designed JUST FOR THEM! These are foster kids, kids from the court systems with all sorts of abuse, and allowing them to be kids and experience things, that most all other kids have experienced, in setting that’s safe for them, to make each and every one of them feel “worthy”! You are very generous with your ideas and techniques; this is a first I think in coloring glass. You also are so generous in giving donations to favorite charities; I would like to see AutismSpeaks benefit from your generosity. Thank you. Loved the video. A real “why didn’t I think of that? ?” moment, so thanks for sharing. I love it when you use older stamps sets again. By the time I get a certain stamp set the buzz has gone elsewhere. Feels good to use a set many times after purchasing it. The stretched tank & globe were another “why didn’t I think of that?? ?” moment. Thanks for the light bulb moments, however vicarious. As far as tutorials I would suggest doing what you feel like, if any at all. You’re one busy lady and you certainly don’t owe us anything. If I really have to cast a vote I would say for the technique of using blues and purples to look like air as in the clamshell example. That looks the hardest to me – making air look like it’s sorta there but not there at the same time. As far as charities go it’s always hard for me to pick just one. This time I recommend putting some of your money toward initiatives that use art education to help at-risk youth. Not living in your corner of the world I hate to point toward an organization of which I have no personal knowledge. Thanks again for another great video and more useful tips! Please give to the Cystic Fibrosis foundation in NJ. My cousin’s son has CF. He is losing his battle, but they continue to fund raise to help other families who are confronting this deadly condition. Maybe the organization will be able to find a treatment that will prevent any further deaths. I had to pin your video showing all of the glass images! I would be happy to see more details on any or all of them! Got to agree with a previous comment… that bubblegum machine is awesome. I have 2 favorite charities. Sorry I can’t pick one over the other! First off is “Nate’s Honor Rescue” in Sarasota where we got our wonderful lab-mix Lucy!!!! They are a no-kill shelter who rescued Lucy from a high-kill shelter after she & her 8 litter mates were found behind a Walmart in Georgia. Sandy, What an awesome idea! I’ll be sharing the fairy behind the globe and the aquarium!! Can’t wait to try this myself My favorite charity is Shriners Hospital for Children! My husband is a Shriner and we go all out and support their 22 hospitals across North America. They care for children with orthopedic, burn, and cleft lip & pallet through age 18 at no cost!! Visit them at http://www.lovetotherescue.org/ We’d love to have you share in their joy!! Love the “fairy in a glass”…!! My favorite charity is St Jude’s Hospital…Awesome giveaway…!! Hi Sandy, love all these projects. I think the fairies are my favorite. My favorite charity is http://www.forgotten4paws.org We adopted our fur child, Phoebe, from there. Phoebe is an orange cat. Sandy, everyone of your examples are dynamite but I love the bubble gum machine!! Sweet! Animal rescue league would be my choice for a donation. In the Pittsburgh area they are the no-kill rescue and I personally feel, the best. Thank you for everything you have done and all that you will do. Hugs! I love the techniques and tutorial! One of my favorite charities is Fisher House Foundation. My favorite charity is Guide Dogs of America (I am a volunteer puppy raiser for them)…they provide guide dogs at no cost to people with visual impairments, and they receive no government money to do so. But I also love Team Rubicon, a global disaster relief organization that gives military veterans the opportunity to use their skills in a different kind of mission. Thanks for doing this, Sandy! soooo generous of you!! I love an organization called Hospice Hearts in Champaign-Urbana, IL. its a group that takes in the pets of those who are in hospice care, moving to assisted living, or who have passed away, and finds new homes for them so they never see a day inside an animal shelter. many of the pets end up needing a little extra TLC (tooth removal, medications, special food), since they’re often the babies of an elderly person who can’t provide all those special touches. I would be honored if you would check them out on Facebook! Love this tutorial on highlighting glass. You are so generous in sharing your knowledge and in giving to charities. One of my favorite charities is “Dawn’s Place” – ahomefordawn.org Thanks for all you do. Love how you do this! My favorite charity is the American Cancer Society. I have survived breast cancer not once but twice. They were very helpful providing information and resources. Great tutorials! One of my favorite charities is Paws With a Cause. Keep up the good work! 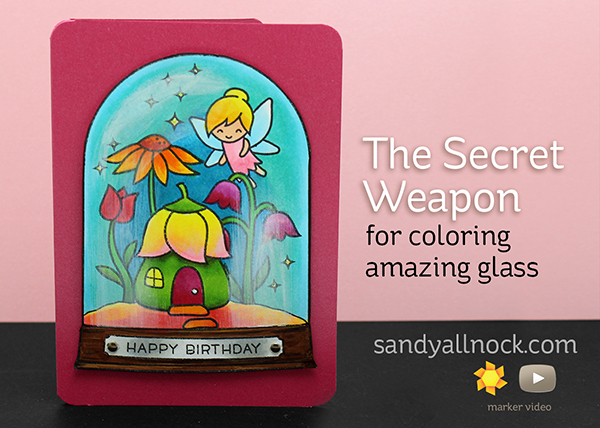 I love your fairy glass card! My pick for charities is our local one about stopping heroin. My beautiful daughter has lost many of her schoolmates to heroin overdoses in the last couple of years. I’ve been blessed that she doesn’t have anything to do with that terrible drug. Thank you! Such a great technique! Your art skills never cease to amaze me! The charity I support is The Global Foundation for Peroxisomal Disorders (thegfpd.org). What a fantastic idea for a giveaway! Thanks for the chance! Fantastic technique! My favorite charity is Second Chance Animal Shelter in East Brookfield, MA. I spend many hours there and they are such a great organization. I also make cards for them as they need them…..I mAke sure they are well stocked. Hi Sandy, I don’t engage in social media, so I’ll let you know my choice for a tutorial would be the Lawn Fawn Fawn fairies in the snow globe. In terms of a charity, I try to support my local animal shelter whenever possible.